1. Preheat the waffle iron. 2. In a large bowl, sift flour, baking powder, sugar, salt. Add in the melted California butter, eggs, milk, and combine. Once the batter is mixed, add the grated California Cheddar cheese and 6 pieces of bacon crumbled. Fold in the ingredients until they are incorporated evenly into the batter. 3. Once batter is ready and waffle iron is hot, pour enough batter to fill the cavity (amount will vary by waffle iron) and close. Cook according to your waffle iron's instructions. 4. 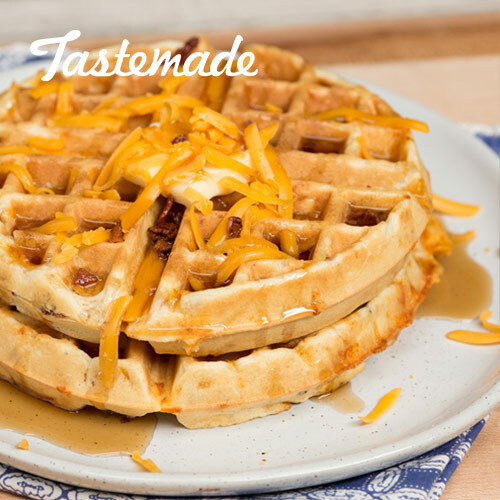 Serve immediately topped with a little butter, additional shredded California Cheddar, bacon crumbles, and pure maple syrup.